Run Into a Snag Lately? Text and Photography Copyright Jerry & Barbara Jividen. True for most of us, it isn't good to run into a snag of any kind. Life seems complicated enough without obstacles, right? But the backyard birder or wildlife photographer, however, recognizes that snags--or dead trees--are very important to many living creatures in nature. So that's why we have incorporated snags into our backyard landscaping. Our "homey habitat" now attracts more Nuthatches, Woodpeckers, and other birds--including an occasional Hawk. Since many birds and some mammals are cavity nesters and prefer taking residence in deadwood instead of living trees, nearby snags can be very beneficial. They not only provide habitat and shelter that attract those animals, but birds in general will perch on a snag. This is not only good for the birds, but it can give you great opportunities to view and photograph them from a desired distance and location--with optimum results! And because many insects are found in dead wood, snags provide an important food source for birds as well. If you don't happen to have a snag in a desired location, you might try transplanting one like we did. While it might sound bizarre to landscape with dead, decaying trees, and while most neighbors may not like the looks of your backyard afterward, you can add another dimension to your birdwatching and photography by simply adding a snag. Once your snag is in place, place a birdbath nearby. A source of water is always important in the overall condition of your backyard bird habitat. 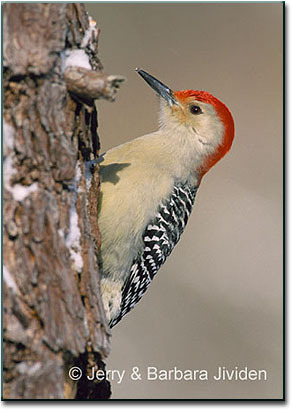 Also hang a suet feeder or two on your rotting roost; then closely position smaller trees for additional perches. For a maximum bird haven, we also set out bird feeders to attract the birds that prefer seeds, like many songbirds. Now, the only snag we encounter is having enough time to birdwatch and photograph all day! 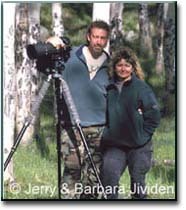 Jerry and Barbara Jividen are the husband-wife team who own and operate Images Unique Photography and Images Unique Wildlife Advantages. In addition to leading photo workshops* and tours, both are certified photography instructors. They market stock photography and produce "how-to" articles for a variety of publications, including NANPA's Currents. Their photography has been published by the National Geographic Books Division, Falcon Press, Voyageur Press, Abbeville Press, Photographer's Market, Outdoor & Nature Photography, Animal Watch, and the Great Smoky Mountains Institute at Tremont. The team also produces "Insights on Images," a professional photography journal (quarterly) for photographers. *For a complete listing of upcoming workshops and tours, or for a free copy of "Insights on Images," call (800) 866-8655 or send email through their web site: www.imagesunique.com.